As a board-certified plastic surgeon, Dr. Marco Ellis specializes in cosmetic and reconstructive surgery of the face and body. Dr. Ellis practices all aspects of plastic surgery but has expertise in reconstructive surgery of the face. His unique training, experience and knowledge in facial surgery give him unparalleled expertise in assessing facial form. He specializes in cosmetic and complex reconstructive surgery of the face, ranging from revision cosmetic surgery and jaw reconstructive surgery. He continues to implement innovative and state-of-the-art reconstructive options to patients with cancer and complex wounds. 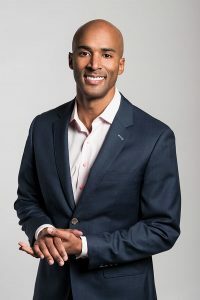 Dr. Marco Ellis is a Diplomate of the American Board of Plastic Surgeons and Fellow of the American College of Surgeons. He is an assistant professor in the Division of Plastic and Reconstructive Surgery at the Feinberg School of Medicine, Northwestern University. He also holds a title in the Department of Neurological Surgery, where he participates in complex scalp and skull reconstruction. Dr. Ellis is also an adjunct assistant professor at the University of Illinois Chicago in the Division of Plastic, Reconstructive and Cosmetic Surgery. He holds the title of Director of Microsurgery and Breast Services. Dr. Ellis is an associate program director of the integrated plastic surgery residency program. He has been honored for his commitment to teaching, educating, and diversity. He leads several didactic sessions, observerships and cadaver dissections throughout the year. After graduating from University of Virginia, where he received his BS in Chemistry specializing in biochemistry, he received his MD degree from Harvard Medical School. After completing his internship and residency in at Northwestern Memorial Hospital, he continued to become a fellow at both John Hopkins Hospital and University of Maryland/ Shock Trauma Medical Center in craniofacial surgery and microsurgery. During his time in Baltimore, he trained with the team that revolutionized face transplant surgery. Dr. Ellis has also completed a research fellowship in congenital and adult jaw surgery at Shriners Hospital for Children in Chicago. Dr. Ellis lectures at national and international symposia on cosmetic and reconstructive surgery. He is the co-author of several publications and abstracts in premier scientific journals, as well as a book contributor on breast reconstruction, eyelid and craniofacial surgery. Dr. Ellis is “driven to help patients identify and articulate their areas of concerns” and from that point, he “educates and explains their options in a clear and concise manner”. According to Dr. Ellis “my ultimate goal is to guide their decision making and do my best to meet their expectations”. Pravin Patel, M.D. Development of Virtual Orthognathic Surgery. Steven Rauch, M.D. Study of Hormonal Influence on Hemangioma Evolution. Barbara Sherry, Ph.D. Investigation of Down-Regulation Mechanism of CC chemokine receptors with Lipopolysaccharide Activation. Joseph Shrager, M.D. Study of Lung Volume Reduction Surgery Effects on Myosin Heavy Chain Composition of the Diaphragm in COPD. James Marshall, Ph.D. Preliminary Investigation of Cyclic Diastereoselective Additions Using Organozinc Reagents. Peter Slavin, M.D. Devised the framework for an in-house consultation service. Composed an annual update and analysis of current medical management initiatives. Provided technical support for students and faculty in on-campus computer centers. Designed and implemented PDA and computing software. Biomet Masters Series Course in Orthognathic Surgery, May 2015, Jacksonville, FL. Dorfman RG, Basu CB, Qui C, Ellis MF, Kim JY. The Good, The Bad, & The Ugly: A Quantitative and Qualitative Analysis of Online Plastic Surgery Reviews. Plast. Reconstr. Surg [submitted]. Hwang LH, Spitz JA, Ellis MF. Visor flap scalp reconstruction: minimizing donor site morbidity of scalp advancement. J Craniofac Surg. Dec 2016. Hwang LH, Ellis MF. Fibula flap harvest: How leg selection impacts inset for mandible defects. Microsurgery. Jul 2016. Ellis MF. Blepharoplasty. In: Buck DW, editor. Review of Plastic Surgery. Seattle: Amazon Digital Services, 2015. Abt NB, Ellis MF. Dealing with Complications. In: Rosson GD, editor. Breast Reconstruction. Philadelphia: Lippincott, Williams & Wilkins, 2013. Khattab M, Ellis MF. The Impact of Radiation and Chemotherapy. In: Rosson GD, editor. Breast Reconstruction. Philadelphia: Lippincott, Williams & Wilkins, 2013. Ellis MF, Few JW. Blepharoplasty. In: Neligan PC, editor. Plastic Surgery. 3rd ed. London: Elsevier Health Sciences; 2012. Rawlani V, Ellis MF, Johnson SA, Khan S, Hansen N, Chopp D, Kim JY. A Geometric Analysis of Mastectomy Incisions: Optimizing Intraoperative Breast Volume. Canadian J Plast Surg, Vol 19(2): 45-50, Summer 2011. Patel PK, Ellis MF. Craniofacial, Distraction Osteogenesis. eMedicine Plastic Surgery Journal 2009. Zhao L, O’Gara MA, Curtiss A, Monahan R, Ellis MF, Patel PK. A three-dimensional assessment of upper airway space changes after orthognathic surgery: Protocol Development. American Cleft Palate- Craniofacial Association, Scottsdale, AZ, April 2009. Ellis MF, Zhao L, Patel PK. Management of alloplastic cranioplasty complications in children. Midwestern Association of Plastic Surgeons, Chicago, IL, April 2009. Spitz JA, Bradford P, Ellis MF. How Big is Too Big: Pushing the Obesity Limits in Microsurgical Breast Reconstruction. American Association of Plastic Surgery, Austin, TX, March 2017. Hwang LH, Spitz JA, Ellis MF. The Visor Flap: a novel design for scalp wound closure. American Society of Plastic Surgery, Los Angeles, LA, October 2016. Asymmetry. Midwestern Association of Plastic Surgery, Chicago IL, April 2016. Hwang LH, Spitz JA, Ellis MF. The Visor Flap: a novel design for scalp wound closure. Midwestern Association of Plastic Surgery, Chicago IL, April 2016. Ellis MF, Patel PK, Zhao L. Applications of Virtual Surgery in Monobloc Reconstruction. Annual Research & Alumni Day, Division of Plastic Surgery. Northwestern University, Feinberg School of Medicine, Chicago, IL, June 2012. Ellis MF, Patel PK, Zhao L, Christensen A. Development and Outcome of a Patient-specific Distractor Guide for Craniofacial Distraction Osteogenesis. Annual Research & Alumni Day, Division of Plastic Surgery. Northwestern University, Feinberg School of Medicine, Chicago, IL, June 2011. Morris DE, Ellis M, Zhao L, Patel PK. Bringing 3-D Plans for Orthognathic Surgery to Reality: One Center’s Experience with Rapid-Prototype Splints and Cutting Guides. ADT Advances in Head & Neck Reconstruction, 4th International Conference, Freiburg, Germany, May 2011. Ellis MF, Patel PK, Zhao L, Christensen A. Development and Outcome of a Patient-specific Distractor Guide for Craniofacial Distraction Osteogenesis. ADT Advances in Head & Neck Reconstruction, 4th International Conference, Freiburg, Germany, May 2011. Ellis MF, Zhao L, Patel PK. Applications of Virtual Surgery in Craniosynostosis Reconstruction. 2010 Challenges in Fracture Care Across Disciplines: AO Symposium. Phoenix, AZ, November 2010. Ellis, MF. Grand Rounds: Controversies in Necklift Surgery, University of Illinois Chicago, Division of Plastic Surgery, February 2017. Ellis, MF. Grand Rounds: Management of Orbitozygomatic Fractures, University of Illinois Chicago, Division of Plastic Surgery, December 2016. Ellis, MF. Grand Rounds: Facial Reanimation, University of Illinois Chicago, Division of Plastic Surgery, October 2016. Ellis, MF. Grand Rounds: Principles of Mandibular Condylar Surgery. Northwestern Memorial Hospital, Division of Plastic Surgery, January 2016. Ellis, MF. Grand Rounds: Principles of Mandibular Condylar Surgery. University of Chicago, Division of Plastic Surgery, December 2015. Ellis, MF. Grand Rounds: Historical Perspective of Microsurgery, University of Illinois Chicago, Division of Plastic Surgery, July 2015. Ellis, MF. Grand Rounds: Microsurgical Breast Reconstruction. University of Illinois Chicago, Division of Plastic Surgery, May 2015. Ellis, MF. Grand Rounds: Controversies in Breast Reconstruction. University of Illinois Chicago, Division of Plastic Surgery, January 2015. Ellis MF, Reid R, Persing J. Neurosurgical Disasters: Scalp Reconstruction. American Society of Plastic Surgery National Meeting, Chicago, October 2014. Ellis MF. Grand Rounds: Syndrome of the Trephined. Rehabilitation Institute of Chicago, Department of Physical Medicine, Mar 2014. Ellis MF. Grand Rounds: Wound Healing Principles and Reconstruction. Northwestern Memorial Hospital, Department of Gynecology and Obstetrics. Jan 2014. Ellis MF. Grand Rounds: Surgical Treatment of Migraines. Johns Hopkins Hospital, Division of Plastic Surgery, Mar 2013. Ellis MF. Grand Rounds: Controversies in Neck Lifting. Northwestern Memorial Hospital, Division of Plastic Surgery, May 2012. Ellis MF. Grand Rounds: Aesthetic Contouring of the Facial Skeleton. Northwestern Memorial Hospital, Division of Plastic Surgery, September 2011. Ellis MF. Grand Rounds: Basilar Joint Arthritis. Northwestern Memorial Hospital, Division of Plastic Surgery, April 2010. Ellis MF. Grand Rounds: Cleft Alveolar Reconstruction. Northwestern Memorial Hospital, Division of Plastic Surgery, October 2010. Ellis MF, Groh C, Zhao L, Morris DA, Patel PK. Upper Airway Comparison of Patients with Class II and Class III malocclusion: Development of 3-Dimensional Model and Protocol. Midwestern Association of Plastic Surgeons, Chicago, IL, May 2010. Ellis MF. Grand Rounds: Functional Rhinoplasty. Northwestern Memorial Hospital, Division of Plastic Surgery, May 2010. Ellis MF. The Use of Alloplastic Implants in Plastic Surgery. University of Virginia, Department of Chemistry. Plastic Project, Interdisciplinary Educational Series, March 2010. Ellis MF. Grand Rounds: Thyroid Orbitopathy. Northwestern Memorial Hospital, Division of Plastic Surgery, October 2009. Ellis MF, Zhao L, Patel PK. Grand Rounds: Comprehensive finite element analysis of orbital floor fractures. Northwestern Memorial Hospital, Department of Surgery Research Conference, October 2008. 675 N Saint Clair St.